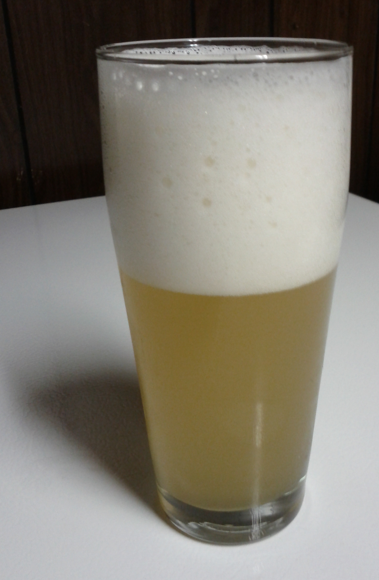 So its been a few weeks, and the Berliner Weiss is ready. The beer started at 1.032 and ended at 1.006. Nearly white in colour, with a wheat beer haziness, and a thick heavy head, this beer appears to be a conventional wheat beer. That impression fades with the first whiff of the beers aroma – which is dominated by a sour lactic aroma, and only mild hits of hops and malt. This strangeness is enhanced when the brew is sipped. A strong and slightly pungent lactic acid acidity dominates the beer, overlaying a mild maltiness – more sourness than any sour I’ve tried previously, but not unpleasantly so. The hop flavour is subtle; detectable more because I was looking for it than any overt presence. One of the odder aspects is the mouthfeel of the beer. as suggested by the low OG, it is thin and dry. But that is paralleled by an unusual carbonation – fine bubbles that nucleate on the tongue, tickling the mouth – bubbles more at home in a sparkling wine than in a beer. Lacking both raspberry and woodruff syrup, I was limited to mit schuss (sugar), mixing with another beer, and something uniquely Canadian – lets call it ‘mit Ahorn‘ (with maple – AKA maple syrup). mit schuss: To serve this mit schuss I made a simple syrup using equal parts table sugar (sucrose) and water. This was heated in the microwave until the sugar was dissolved. This was added bit-by-bit to see the effect. At low doses this cuts the sourness without significantly altering the flavour profile. At higher doses the sweetness begins to emerge, while the sourness fades ever more into the background. All too soon the amount of sugar added was too much, producing an unbalanced sweet beverage with a mild malt flavour. Mixed with Beer: Traditionally, Berliner Weisse is mixed with a hoppy lager like pilsner. I didn’t have anything like this on hand, but I did have my Saison. There is only one way to describe a 50:50 mix of the two WOW!!! Yes – ‘wow’, in capital, with multiple explanation marks. The grapefuit and vinous notes of the saison blended with the lactic aroma went perfectly with the lactic acid aroma of the weisse, accenting the citrus nature of the saison. This unexpected symbiosis worked at the flavour level as well – the acidity of the weisse balancing nicely with the fruity hop and yeast character of the saison. Even the saison’s bitterness worked with the weisse, with the combined weiss sourness + fruit hop/yeast flavours + bitterness producing an amazingly well balanced beer. mit Ahorn: My maple syrup to weisse ratio was a little more on the maple side than ideal; none-the-less, the sweetness of the syrup cut the sourness of the beer significantly. A bit of maple aroma can be detected, but the biggest difference is the taste. The taste-forward sourness is gone; in its place was an overly-sweet malt flavour. Surprisingly, despite the over-use of the syrup, little maple flavour was detectable. Given that the same effect can be reached mit schuss, I’d recommend against the maple.